I had a friend call me the other day. She was licensed about 25 years ago as N4VMN, but her license has since lapsed. 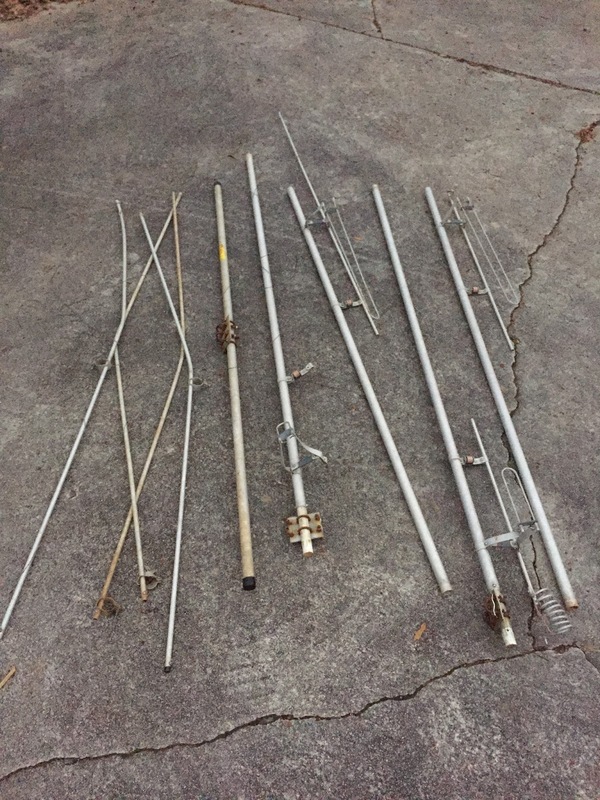 In any case, she had some antennas that had been sitting out at beside her house in Marietta for quite a few years now -- she wanted to know if I might know anyone who could make use of them. 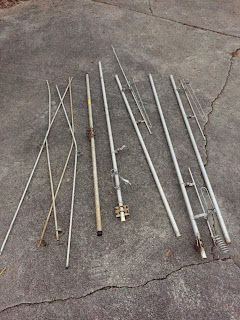 Well, I'm always interested in antenna projects, and I could certainly use some smaller antennas, so I said, sure, I could use them. She had a slightly bent Ringo Ranger, and an old Butternut HF4B. Ah, the Butternut HF4B. I had one in Stone Mountain, GA from late 1987 until 1991, when I replaced it with a Cushcraft A3S. N4VMN lived in another part of the same subdivision back then. She gotten licensed, bought a rig, and put up this antenna on a roof tower -- and she did it all without consulting me. While I was a bit disappointed I couldn't have given her advice, I was still impressed that she managed to do it all herself. My experience had been that the Cushcraft A3S worked way better than the HF4B, but the Butternut was a solid performer. The HF4B is a light-weight, trap-less tribander that uses large bow-tie shaped elements and a clever matching network. It supports 10, 15 and 20m, also also works on 12m. I never could get mine to match well on 12m, but it worked OK on the other bands. Being only two elements, it didn't offer a lot of gain, but had solid front to back. On difficulty in dealing with this antenna was it was so three-dimensional, as the bow-tie supports go three feet above and below the elements. Overall, though, it is pretty small. It can be easily turned with a small TV-type rotator. N4VMN's antenna had spent a couple of decades outside next to the house. I expected after all this time it might need some repairs. The U-bolts are all shot, and will need to be replaced. The bow-tie supports were all bent, but look repairable. All of the bow-tie wires were broken or missing. The matching network tube supports were all bent, but look repairable. One of the element tubes had filled with water at some point, froze, and split about five inches from the center insulator. It might be repaired with a clamp or two, but replacement is probably a better option. The two fiberglass insulators seem to be in OK shape, although they need to have some of the weathering sanded off and protected with a nice coat of flat black paint (as I did on the R7000). OK, this is going to be a project, but it looks like what remains is serviceable. I could definitely use a small tribander at the Walton County QTH, or even as a South-America facing antenna in Gwinnett County. I'll have to work out a 20-25 foot support to mount it on, eventually. 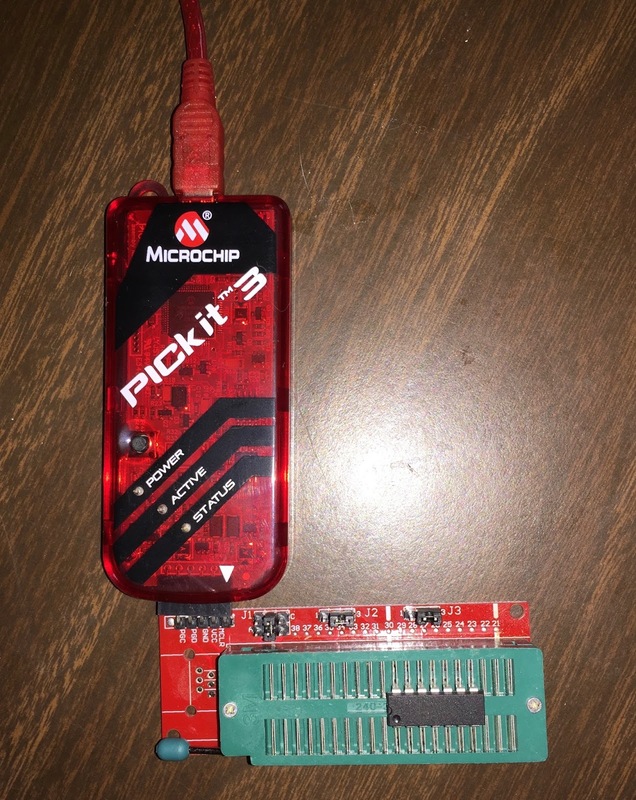 PICkit 3 and DIYMall programming board. 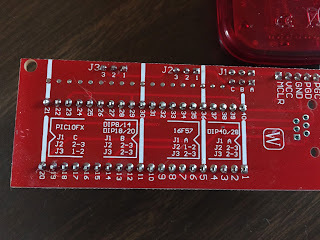 When I wrote the last article about the PIC, I had forgotten to take some pictures of the PICkit 3 and the DIYMall programming board. I've include them here. 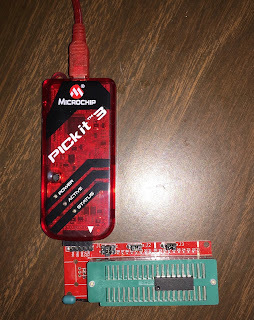 The PICkit 3 is really quite nice little unit, and pretty easy to use, once you figure out the details. 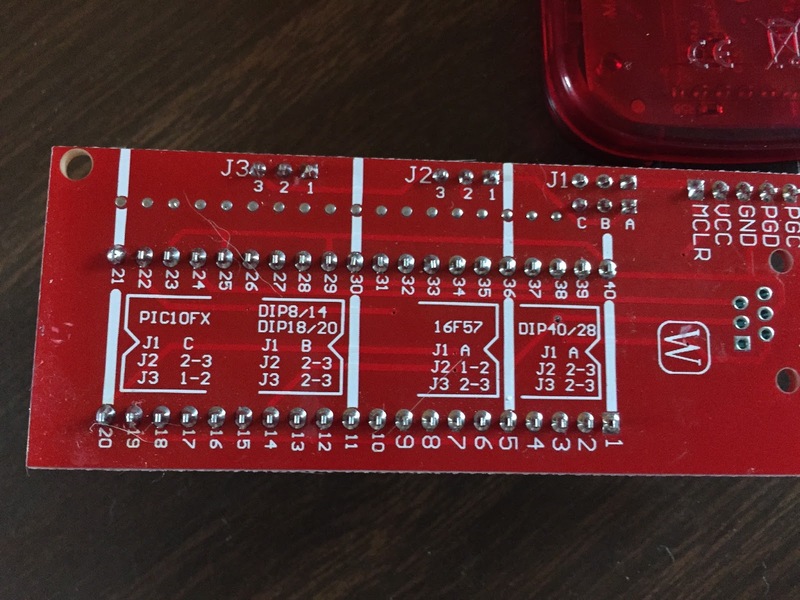 The DIYMall board, which came with no separate documentation, and certainly had no documentation on any web site, appears to have comprehensive, if somewhat cryptic, documentation on the back of the board. You can see the four heavy white lines on the back, that indicate the proper positions for different types of devices. Complete documentation on the back of the DIYMall board. 40 and 28 pin DIPs go and the end, on the 1/40 pin mark. 8, 14, 18 and 20 pin DIPs go at the 11/30 pin mark. PIC16F57 chips have a special place at the 5/36 pin mark. As does the tiny six-pin PIC10FX chips, which go in backwards at the far end the 20/21 pin mark. The three jumpers, J1, J2 and J3 need to be appropriately selected as well. It seems unlikely that a lot of new designs would use the older PIC16F57 or PIC10FX chips, but it is nice to know it is possible. Once you set the jumpers and drop the chip in the right place, they actually program pretty easily.